I'll do my best to keep this as short as I can, though Electronic Arts (EA) has a long history and one could write quite a bit about the company. I've got 135 ads which I believe is second only to what I have for Sega. EA Sports ads could be separated but for now I'm leaving them with the rest of EA. EA was founded in California in 1982 by former Apple employee Trip Hawkins. A few other Apple employees joined EA and the company quickly grew as it recruited more staff from the likes of Atari and Xerox. In 1983 EA released its first games on home computers, including one of the most significant games in the history of the company. That game is Julius Irving/Larry Bird Go One-on-One, or simply One-on-One. This was the first time professional athletes appeared in a computer game, it was an important income source for EA, and it was the first stepping stone into the sports genre of video games that would shape the future of the publisher. While EA did develop some of its own games, it also published games for other developers which led to a large number of releases annually beginning in 1986. EA published nearly 20 games in '86, then more than 25 in '87, and over 30 in '88. In such a short span EA became the largest third-party game publisher. 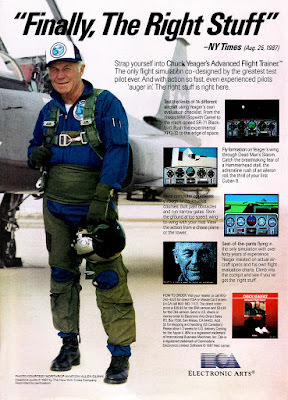 Here is a brief list of some of the best known games that EA published in the '80s: John Madden Football (quite different from what would appear on consoles), Populous, Archon, Chuck Yeager's Advanced Flight Trainer, Earl Weaver Baseball, Starflight, Skate or Die, F/A-18 Interceptor, M.U.L.E., the computer versions of Marble Madness, and some of Interplay's role-playing titles, such as the Bard's Tale sequels and Wasteland. In 1990 EA entered the console games market as a publisher; previously it had only licensed its games to other publishers. Around that same time Trip Hawkins left EA to found The 3DO Company. The '90s was another successful decade for EA as its sports games became so popular during the 16-bit era that EA created the EA Sports brand that is still used today. As I said above, I want to keep this relatively short so I'll just mention a few more things as the company is still going strong today and it's likely many of you are quite familiar with EA. Along with EA Sports, EA Games became a publishing label EA used for a while and there was EA Sports BIG for the more arcade-like games, such as SSX. Jane's Combat Simulations was yet another publishing label EA used as it licensed the Jane's Information Group brand from 1994 to 2000. The last thing I want to mention about its past are some of the most recognizable developers that have been acquired by EA (along with a major game each made before the acquisitions): Origin Systems (Ultima), Bullfrog (Populous), BioWare (Baldur's Gate), Westwood Studios (Command & Conquer), Maxis (SimCity), Digital Illusions CE (Battlefield), PopCap Games (Bejeweled), and DreamWorks Interactive (Medal of Honor). There were many others of course, though I'd say those are the most noteworthy due to the popularity of the games each one developed for EA. Unfortunately, some have since been closed or merged with other studios, and some have been renamed. This post also happens to fall during the week EA announced the closure of Visceral Games, one of its internal studios that was originally known as EA Redwood Shores. Visceral had been working on a single-player Star Wars game that many were looking forward to so I suspect EA's popularity is at an all-time low. Regardless of what you may think of EA today, for better or worse, it's been a very important company in the history of computer and video games. If you were gaming in the '80s and/or '90s EA likely played a big role your time playing games. For myself, I was a big fan of EA during those two decades, especially the EA Sports titles released for the Sega Genesis.